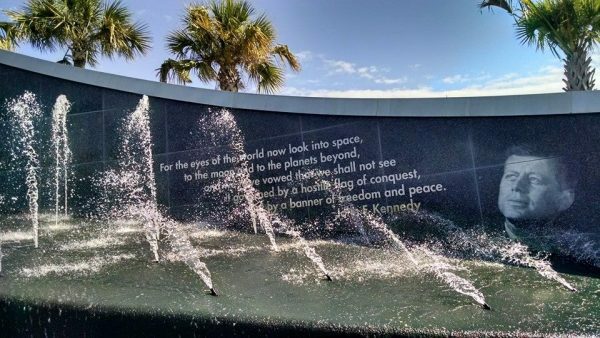 The last full day of our Florida trip was spent visiting the Kennedy Space Center. It is about an hour-long drive from the resorts and theme park area of Orlando. This wasn’t on our original agenda, but I picked up a brochure at the Nickelodeon Resort lobby and the more I read the brochure, the more I wanted to go. We had a rental car so we did not need to take the bus from Orlando to the Kennedy Space Center, but I understand there is one. 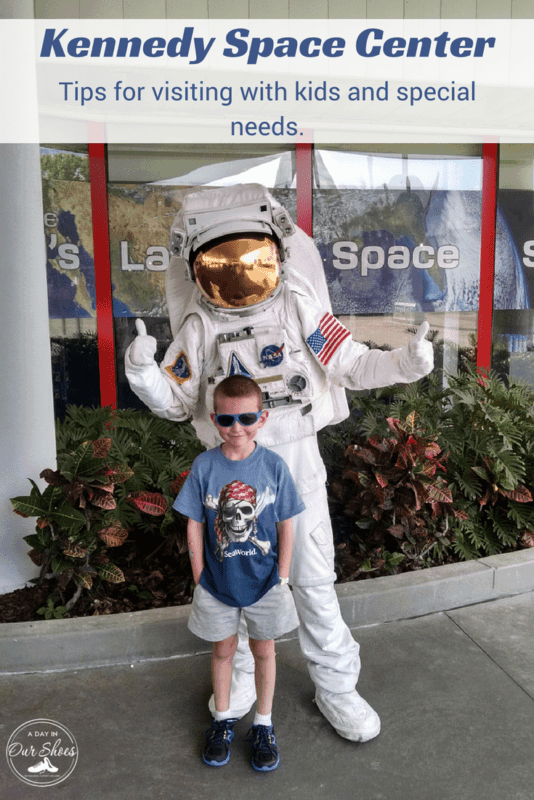 I thought I would share my tips for visiting the Kennedy Space Center with kids and especially kids with sensory issues and special needs. 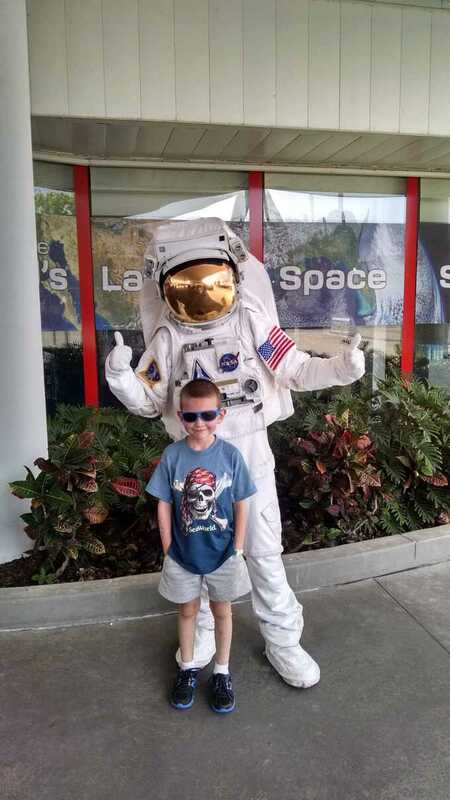 Kennedy Space Center was the highlight of our Orlando trip. You can plan your day so that you get relief from the sun and spend some time indoors. 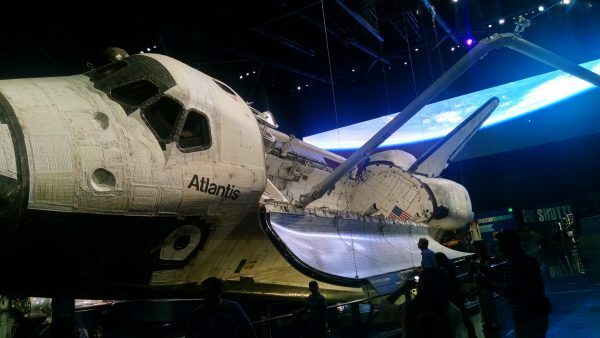 The highlight for me was seeing the Space Shuttle Atlantis and I was so moved by it, it caught me off guard. I’m a “Gen X-er” so the Space Shuttle program was first launched when I was in elementary school and I was in high school when the first one exploded. For the Atlantis’ first launch and landing, we had the TVs on in school, as well as when Challenger exploded. It brought back so many childhood memories to see it sitting there. It’s amazing to see. 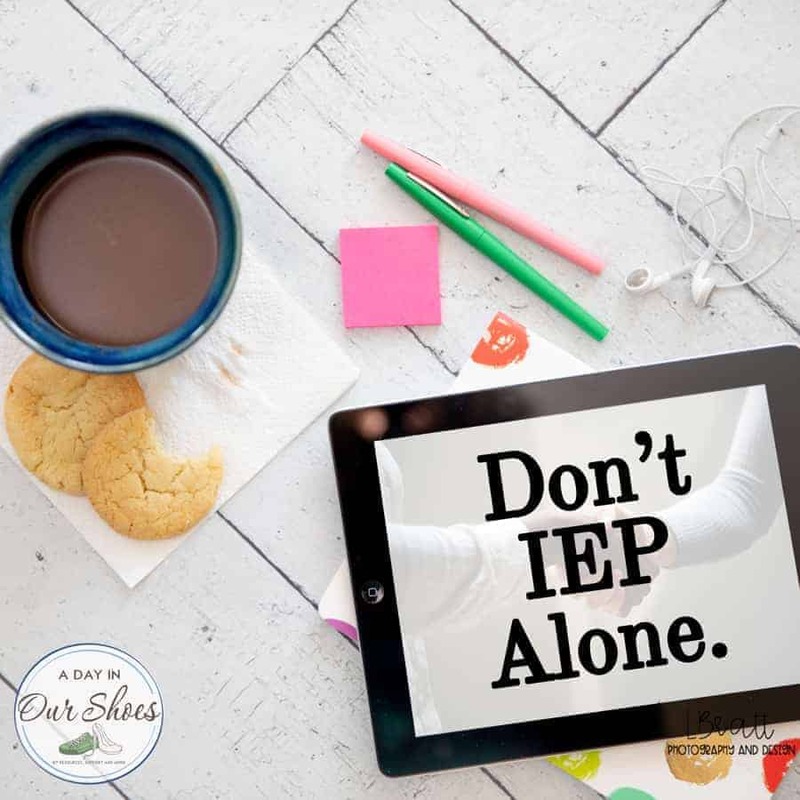 For planning purposes, there are many scheduled activities, which can cause anxiety for some families or kids. 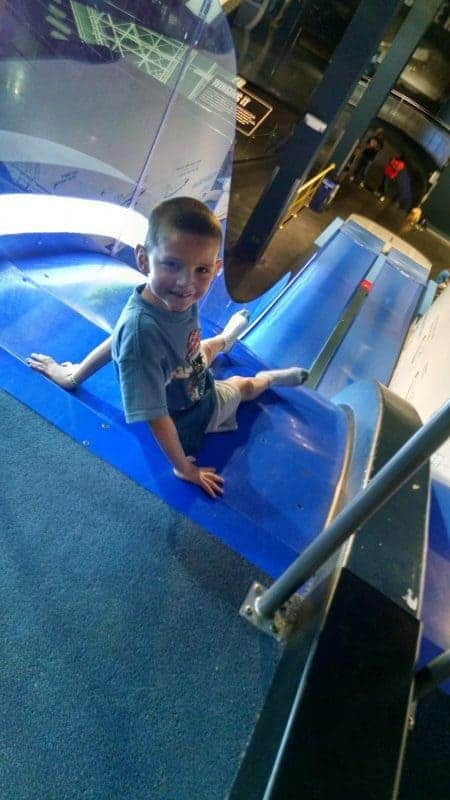 For example, you may have to leave one exhibit where your kids are having fun, in order to make it to the IMAX theater on time to see the movie. 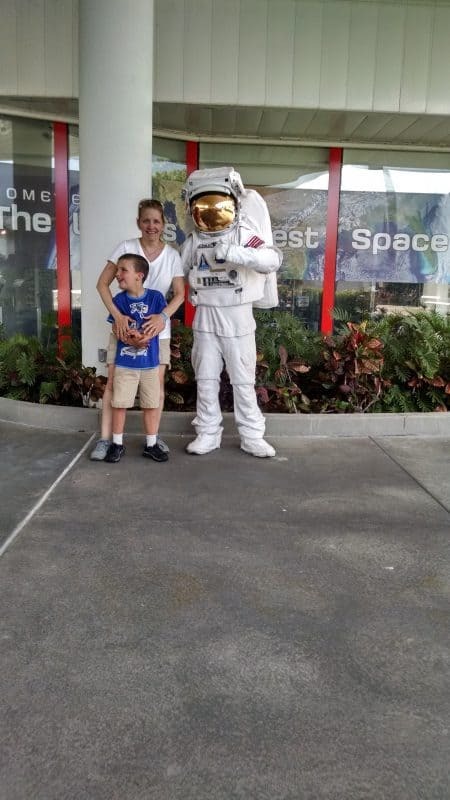 The Kennedy Space Center does a good job of both informing and entertaining adults, as well as keeping smaller kids interested. The one feature that I did not like was not having the option to watch some of the educational films. For example, when you see the Atlantis exhibit, you have to start out there. The Apollo building on the bus tour dumps you into two film rooms without any other options. Overall I enjoyed the trip and I love history nerdy stuff like this. But by the end of the day I was on “educational film overload” and was just anxious for the film to be over. It might be too much for some kids. They have strollers for you to use if you need them, even out at the Apollo exhibit. There are water play activities (Rocket Garden) if your child wants to cool off. Is Kennedy Space Center indoors? It is both indoors and outdoors. There is plenty to do both indoors and outdoors. If the weather is cooperating, it’s a nice mix of both. But I wouldn’t hesitate to go if it was raining. There is still plenty to do. I was getting worn out, but I could have used another hour or two. If you want to see it all, it’s a lot to do in just one day. The bus ride tour out to the launch pad is long. So if you have a small child or one who gets bored and if it’s not working out, you don’t have many options except to ride back. Wheelchairs can be accommodated everywhere, but make prior arrangements for things like the bus tour. We chose the buffet lunch add-on, and you eat with a real astronaut. It’s a bit spendy for lunch and younger kids may not fully appreciate it. But, only a few hundred people out of the billions on the planet have ever gone to outer space, so I wanted to do this. Plenty of different food options available, but if you have specific concerns, check before you go. They serve Tang at the Lunch with an Astronaut event. I thought that was a cute touch. That had fewer food options that other venues, so you may want to ask first. 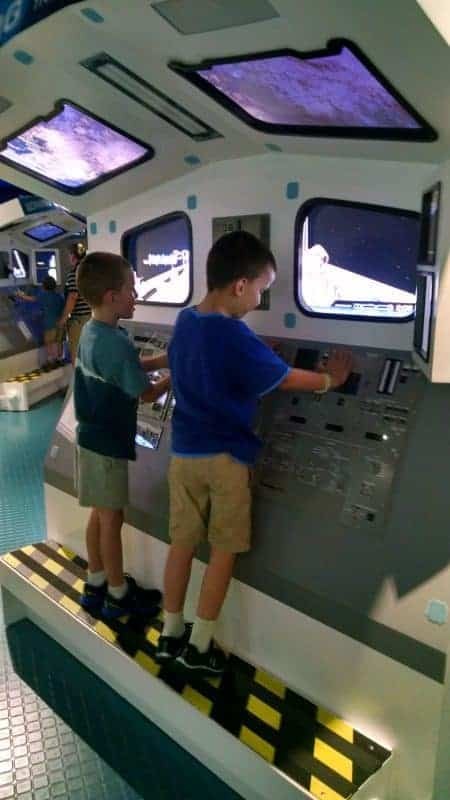 The Space Shuttle Simulator is not as frightening as they make it out to be. Both my kids loved it and Brian said the Harry Potter Gringott’s ride at Universal is much scarier. We found lots of great educational and some stimmy toys in the gift shops. LOTS of fun gift shops! Pace yourself. 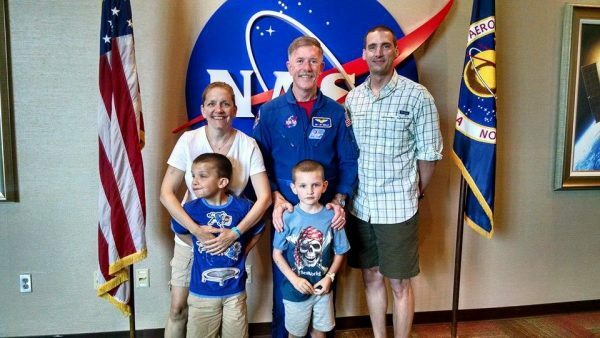 If you don’t want to do Lunch with an Astronaut, there is another afternoon event to meet him/her. The kids had fun playing on the different modules. There are family restrooms and plenty of them! Lots of quiet places to retreat to, if you need to regroup and have quiet time. There are many noisy activities and films, like blast offs and such. Might be too loud for some kids. Each activity has a description in the brochure or online. Ramps and elevators are all over the place. Accessibility not an issue. Plenty of indoor, air-conditioned activities if heat is an issue. Brian wanted to ride this slide over and over. We arrived there just about when it opened (9 am) and stayed until closing. There were still a few things I would have liked to have done like spend more time in the Atlantis exhibit and at the Apollo exhibit. Brian wanted to do the slide more. 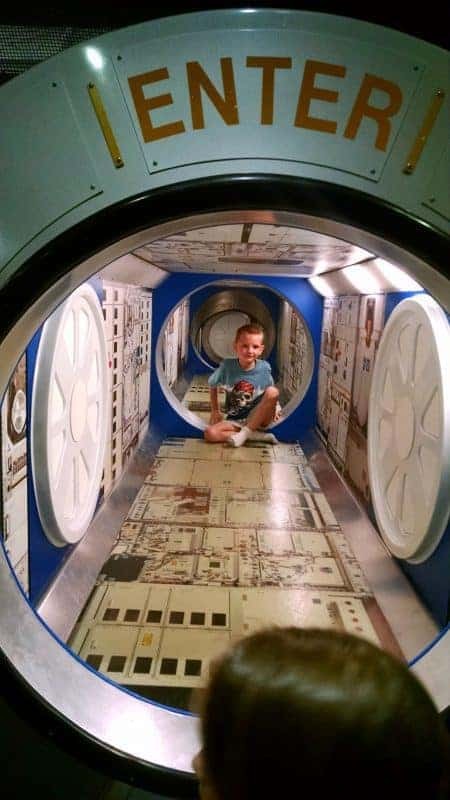 Brian enjoyed climbing around the space tunnels too. We were able to find a multitude of discount options. The lobby of our hotel had them. We also found them online when checking things out on our phones. My MIL was able to get a senior citizen discount too. Or, as in our case, we were way out at the Apollo exhibit (20-minute bus ride) and it was 5:00 and it was starting to shut down. We had to get on the bus and ride back and then we had limited time left at the main center. In other words, you cannot really wander around at your own leisure if you want to do many of the activities because they are at scheduled times. Brian said that this was a highlight for him. I think he thinks it is the same guy we saw at lunch. Seeing all the history stuff was exciting and interesting to me. It made me very wistful and nostalgic. It made me wonder how we could get back to that place as a nation since we all watched TV together to see men go to the moon. We collectively watched and talked about things that matter. And I miss that. 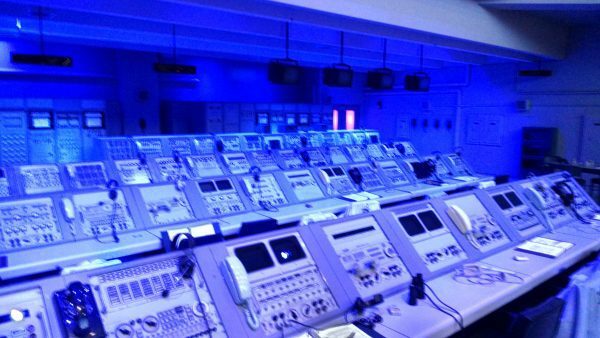 This is the real control center used for Apollo missions, which was really exciting to see. This trip was sponsored in part by Nickelodeon Resorts, Sea World Orlando, Legoland Florida and Universal Orlando Resorts. All opinions are my own. The entrance is a nice tribute to JFK. This post was originally published in 2015. I am updating to fix links and fun stuff like that. « How to get your FREE Lifetime National Parks Pass~Disabilities, 4th grade, Veterans.